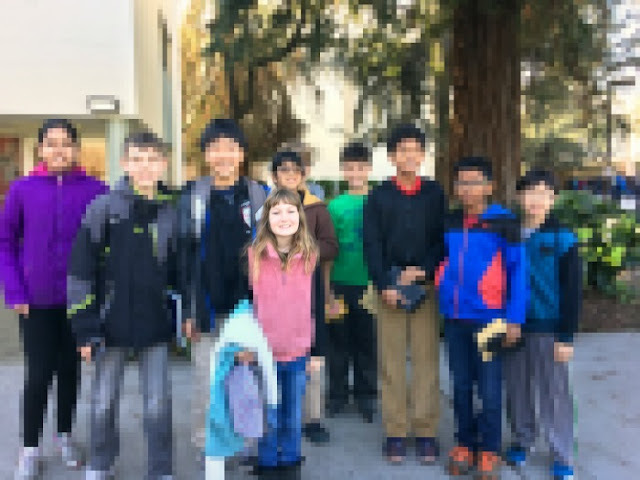 Last Saturday, we took our team of 10 students to our regional chapter competition that took place in our local San Jose State University. Our students had tons of fun, but I also found the experience very educational for me as a coach of our math team. As a coach, I received an interesting document comparing our chapter to national average. An average MATHCOUNTS chapter has about 11 teams and 84 students. Our Santa Clara Valley chapter had 43 teams and 380 students. The main auditorium was completely packed with excited students, their siblings, parents, and coaches. It was a lot of math for one day! In the morning, kids had three written rounds - sprint, target, and team. Then there was lunch and then a separate countdown competition. Only 4 official team members participated in that, but several other kids on my team chose to stay to the end. Because of the number of participants (43x4), it was brutally long. I am grateful that our kids handled themselves very well if you don't count constant questions as to when it's going to end. In terms of population, our county has 35% Asians, 26% Hispanic/Latino, and 35% white residents. However, more than 90% of participants in our chapter were Asians, and all 10 individual winners were Asians. All top winning teams were 100% Asians. So that stereotypes of Asian math whiz kids? Completely true for Silicon Valley! There were also far too few girls. My own team had two out of 10, and I'd say total percentage of girls was about 10% (one girl was in top 10 individual winners). I expected the winners to be private schools that have a luxury to be "selective" about who they accept. In reality, many winning teams came from public middle schools. However,.. all these public schools just "happen" to be in the wealthiest school districts of our county. Granted, one can not make conclusions about general education in these schools based on their competitive math teams that, after all, are also highly selective. However, we do know that those school districts offer much more rigorous curriculum that what we have in our own district, which, by the way, is far from the worst in the county. We have several reasonably talented math kids in our school, and one 7th grader who is outstanding. He is the one who literally "lives and breathes math" and solves math problems at home for fun, not because someone is making him. He placed about 60th in our chapter competition with a score of 42 out of 46. All our other math kids placed in the bottom 25%, which obviously depressed our team score. 9 out of 10 individual winners of our chapter got a mind-boggling perfect score of 46 and needed a tie-breaker to determine individual standing. For a reference, an average national chapter high score is 33 out of 46, which just confirms one more time how insane our chapter is! Our school team placed 36th out of 43 this year, and I think it is awesome. Kids really had a chance to see many talented mathematicians, and they are excited about getting better. While it's unlikely that we will place in top 10 next year, it would be awesome to win The Most Improved Team trophy next year. My co-coach and I talked about the results and did some soul searching. We could focus on out top 5-6 students and try to get them to top level by the next year. But... we want all our kids to have fun in math and feel valuable members of the team. We want all of them to try out for team spots next year and improve their personal best. As long as our kids continue to spend another hour after class to come to our Math Club, continue to spend another hour on our homework and, most importantly, enjoy being seen as "math geeks", we are winning. Have your ever coached your kids in anything? How did it go? It would be nice to change our culture so math is cool and fun for all kids. I love how the Beast Academy books make math competitions look like a fun game show. We need more of that. In our district which is the wealthiest of neighboring districts is mostly white. But there was maybe one or two students from our district. Math is not a priority. Socializing and having a quality of life seem to be the main focus. It's interesting to see how culture dictates levels of achievement as well as priorities in life. I actually actively work to not be teaching my kids, but that's because I'm teaching them all the time, and I want them to have different teachers. Many of the Asians in our school district take extra math classes - I know only of a couple non-Asian children who are taking additional classes (and they aren't my kids). I like that you are focusing on ALL the kids, not only the top 5-6 students. I think that is more important than winning.